Barely into his twenties and already a highly decorated military hero, Army Special Forces veteran Blake Kershaw is now going to college, studying while recuperating from wounds received in Afghanistan, and planning to re-enter the Army as an officer after graduation. But life tosses Blake a curve when his country approaches him about using his special skills to avert a terrorist plot to detonate a nuclear device in a major eastern U.S. city. To do that, he would need to become an operative deep within Al-Qaeda’s innermost circles—changing his entire identity, even his face. A true patriot, Blake makes the journey into a shadow world that leaves friends, family and, seemingly, even God far behind. But when things go terribly wrong, and his country looks set to destroy him, it is God and God’s people who intervene. LTG (Ret.) 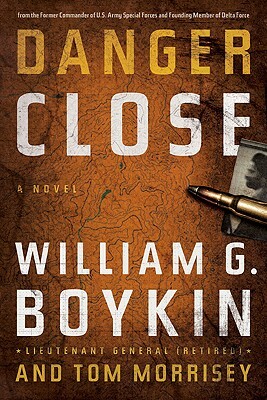 William G. "Jerry" Boykin, author of Danger Close, spent thirty-six years in the United States Army, some of them as an original member of Delta Force, the worldÕs premier Special Operations unit. His life reads like an action-adventure film; Boykin helped capture Panamanian dictator Manuel Noriega, hunted notorious drug lord Pablo Escobar, served in Vietnam, Iran, Mogadishu, Iraq, and Afghanistan, and worked with the CIA. Tom Morrisey, coauthor of Danger Close, is an internationally known adventure-travel writer and all-around wordsmith. A rock climbing and backcountry ski instructor, certified cave diver, and NRA handgun competitor, he is also editor-at-large for Sport Diver magazine and author of the award-nominated novels Yucatan Deep and In High Places.